The Riskies” as they are more popularly known, were better than anyone could remember when they played to the Wooden Horse Folk Club Audience this week. On Wednesday evening at The Moorcock we had as our guests Ruth and Ken Powell, who came up from North West Wales to play for us. Having waited two years to hear them (they are very busy!) 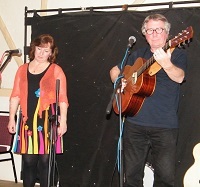 we were not disappointed, Ruth & Ken gave us two great sets of songs, most of which we had never heard before. Some great self-written material, and lots of beautiful, and sometimes quite haunting songs from America written in the 1920's, 30;s and 40's. Ruths lovely voice was expertly accompanied by Ken on two beautiful guitars and a banjo, all of which he had made himself. He also sang harmonies on a lot of the songs. I am finding it difficult to express the "feel" of the night we had, you had to be there to experience it for yourself, a beautiful performance by two lovely and very unaffected musicians, not a "diva" in sight! - - - we had a pretty full house, and lots of people said afterwards that it was one of the best nights they have ever had at The Moorcock, purely for the sheer quality of the songs, the singing, and the music - - - can we have you guys back again before two years please? How can I begin to describe tonight? It was like The Beatles had decided to reform to do another tour. Well almost. The Riskies have not performed together since about 2006 and not at the club since 8 July 2005. We have of course enjoyed the company of all three of them since then in their various forms but just not together. What a superb evening it was. A selection of old favourites and new songs; excellent musicianship from Dave and Ken – guitar mandolin and banjo. Guitars and banjo also made by Ken; crafted harmonies and of course Ruth’s beautiful voice overlaying it all. What more could we ask? All these wonderful songs would mean nothing without a voice to sing them, and what a voice. The husky Ruth Fuga just oozes quality. Every word crystal clear. With a delivery as strong as "Pete Coe", that holds you from the first note to the last.